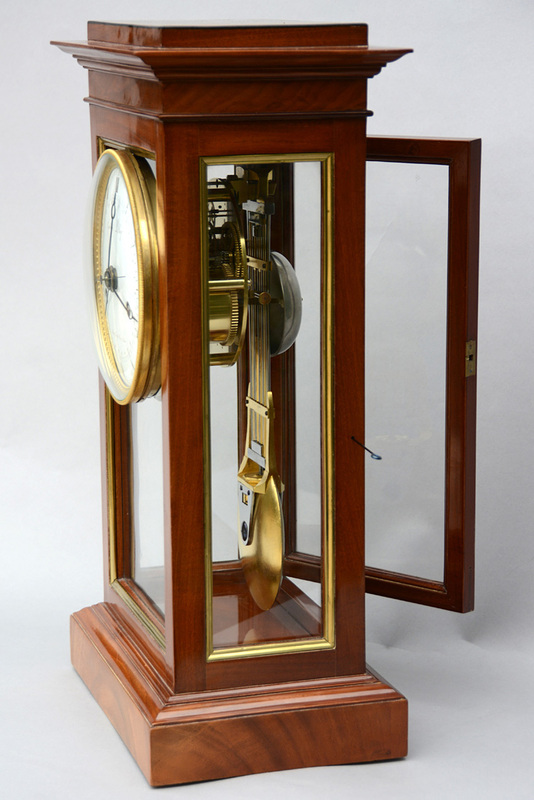 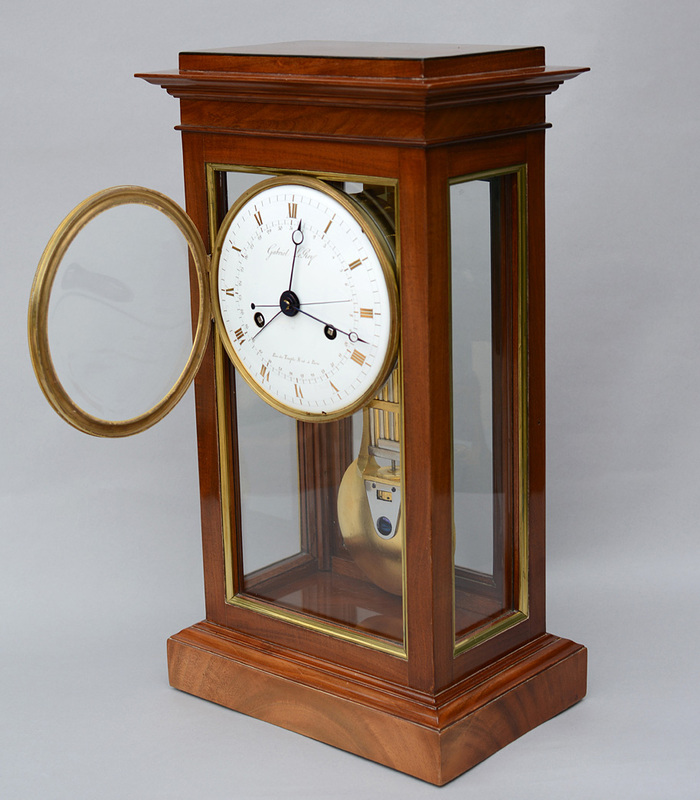 A very high quality table regulator in a mahogany case glazed on all four sides made by Gabriel LeRoy around 1805. 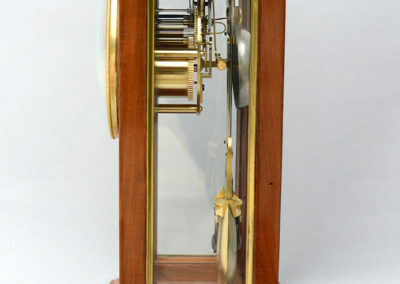 The movement strikes the hour and half hour on a bell, with sweep seconds, calendar, and pinwheel escapement for half seconds. 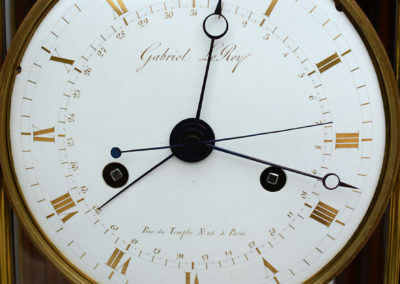 The 6” white enamel dial displays the hours, minutes, seconds, half seconds, and day of the month in gold and is signed ‘Gabriel LeRoy, Rue du Temple No. 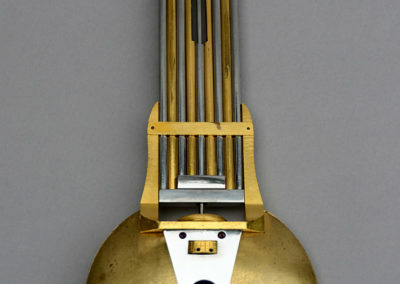 115 a’ Paris’. 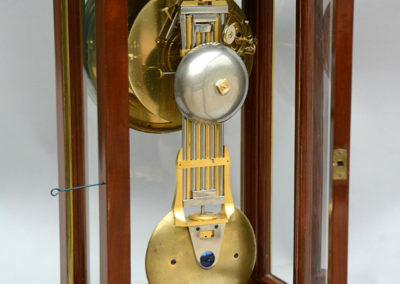 The blued steel hands in the manner of Breguet indicate the minutes and hours in addition to a sweep second and calendar hand which is a ‘jump’ date. 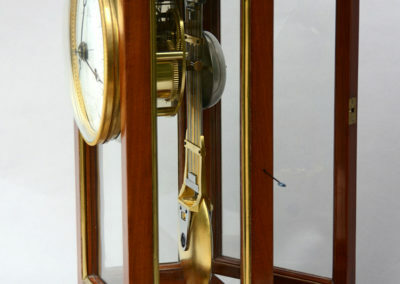 The finely made compensated gridiron pendulum is knife edge suspended with hand formed tapered oval rods. 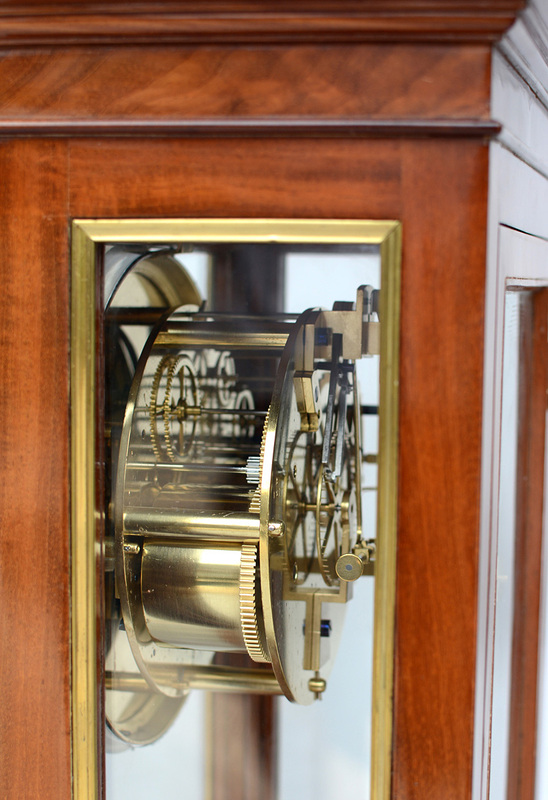 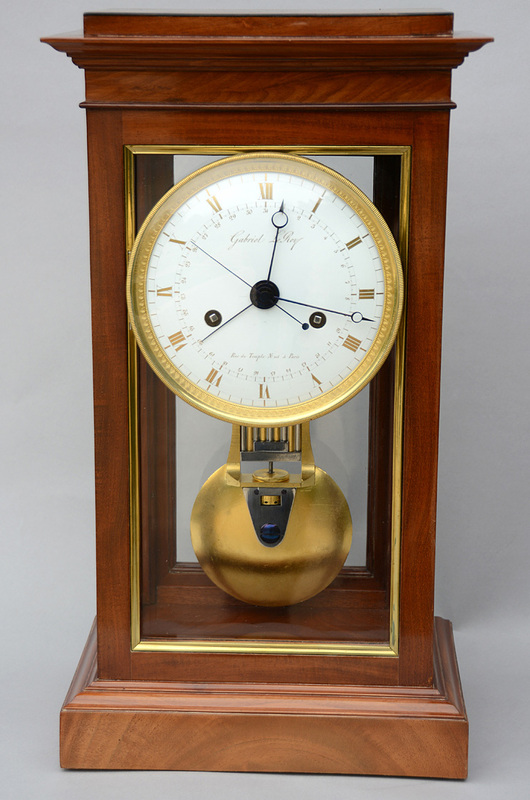 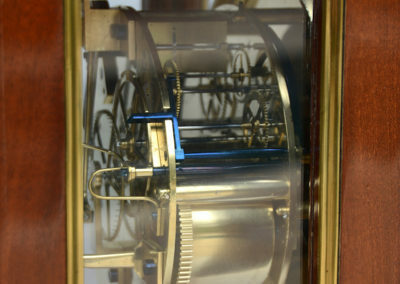 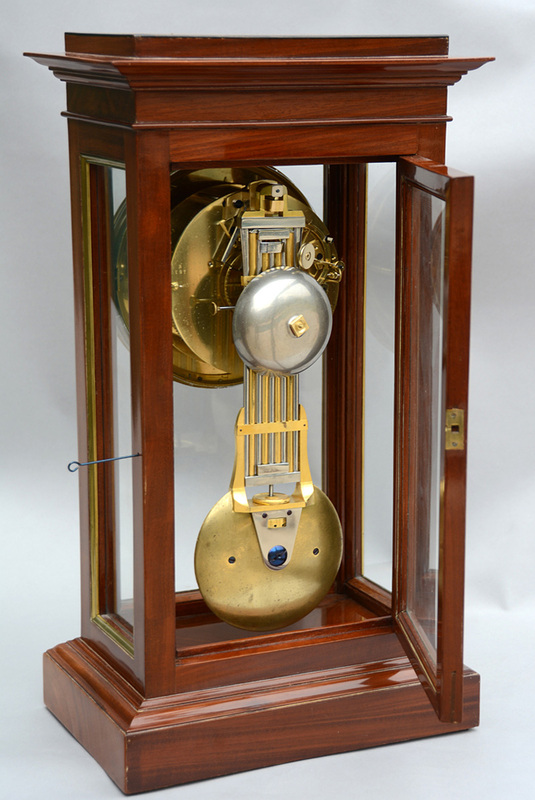 The mercury guilding is still present on the pendulum and the bezel which extends out in front of the case. The case has a number of high quality features including: wood framing on the interior of the glass, ebony stringing inlaid around the top, a ‘hidden’ hole for a ‘push pin’ to open the back door, brass surrounds on all the glazed panels, and the case made with fine grained mahogany. 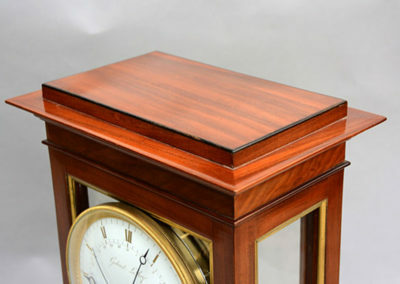 The overall fit and finish of the case is excellent. 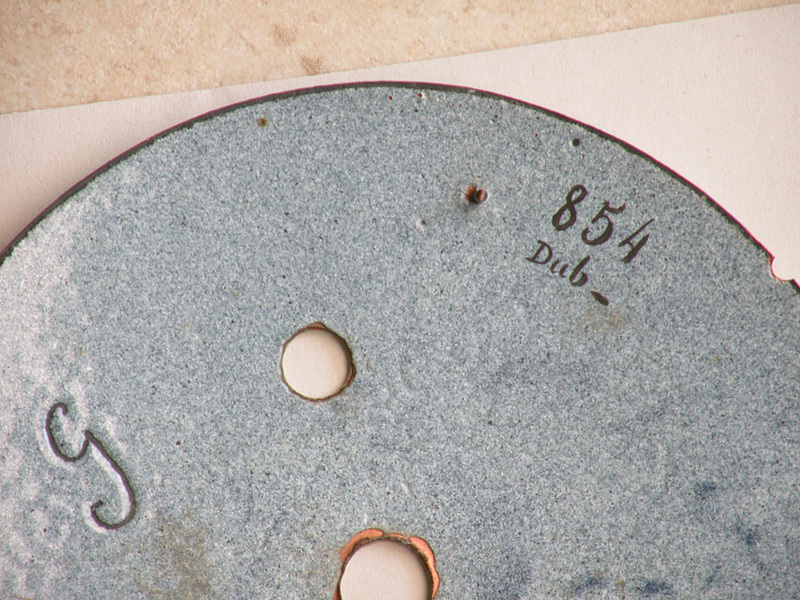 The dial is made by the best dial maker of his time: Dubuisson. 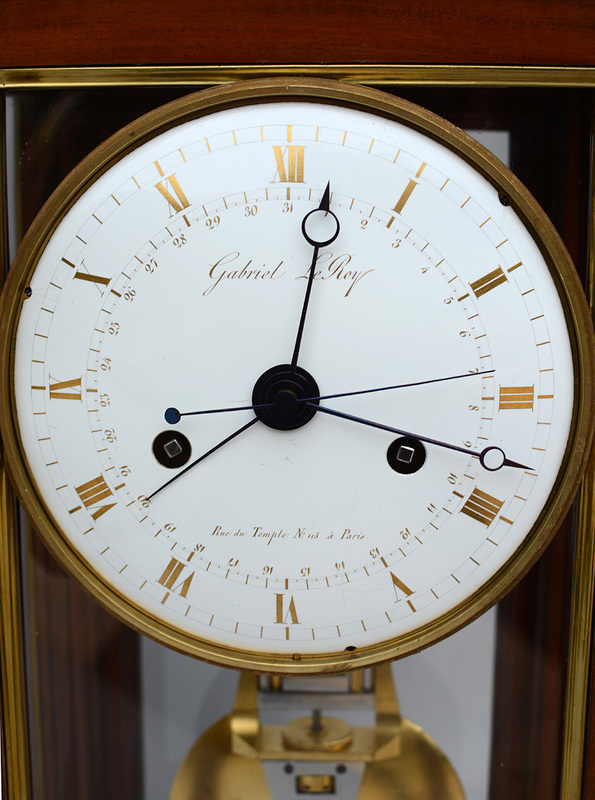 His mark is on the back of the dial, also a g probably for Gabriel. 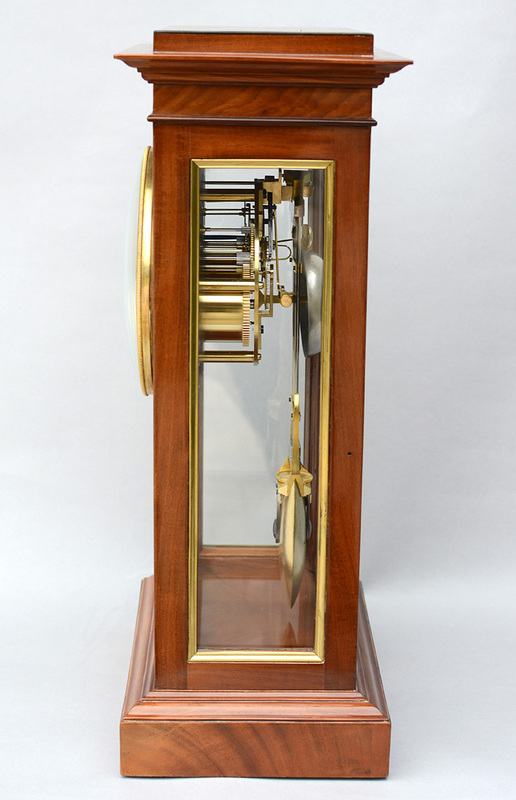 Due to all the unique features of this clock it was most probably custom made for someone that wanted a very special accurate time keeper. 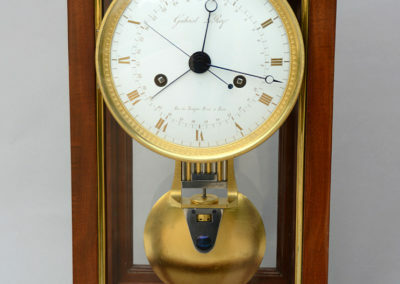 Half second indications on the dial are very rare. 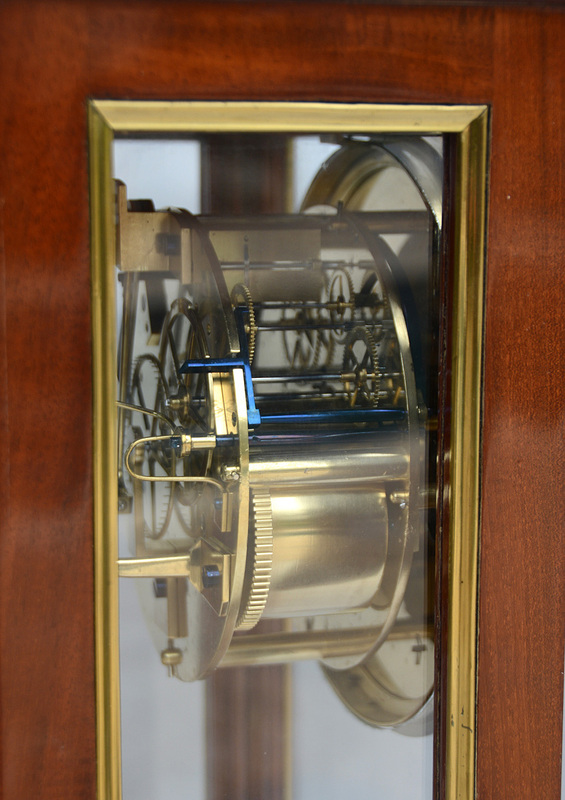 Gabriel Le Roy is documented as working from 115 rue de Temple from 1802 until 1820, during which period he supplied movements for a number of other figural clocks and also appears to have been associated with the clockmaker Lemazurier. 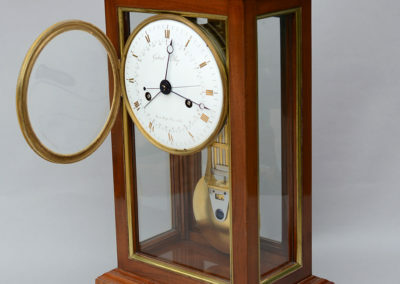 Etienne Gobin, known as Dubuisson (d. circa 1822), watch and clock enameller, worked at Chantilly and Sèvres as a flower painter. 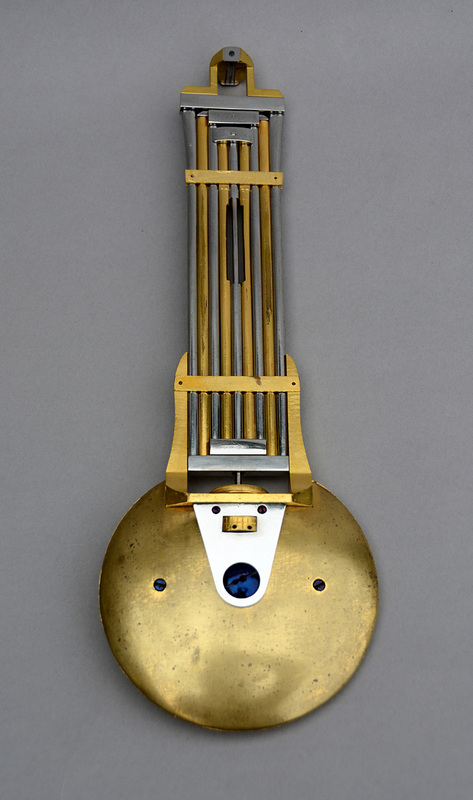 He is recorded in the Rue de la Huchette in the 1790s before moving to Rue de la Calandre around 1812. 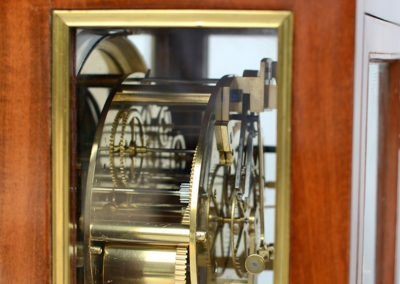 Along with Coteau, Dubuisson was responsible for the finest enamel clock dials in the latter part of the 18th century. 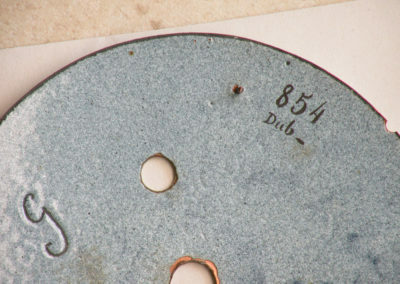 Dimensions: 20″ high, 11″ wide, 7″ deep.